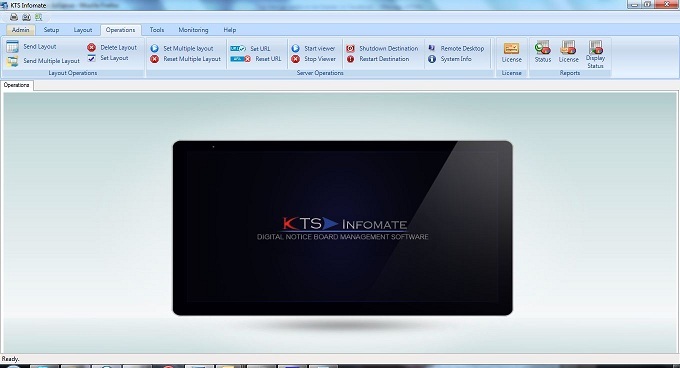 Communicate your information easily and effectively using KTS InfoMate , a software package shipping with all necessary tools and technologies to remotely manage digital signage systems / digital notice boards. This state of the art software solution enables the organizations and advertisement agencies to easily manage their display contents at fraction of the cost compared the traditional style of content display thereby reducing the manpower requirement and increasing the ROI. KTS InfoMate was developed to handle different task of Digital Signage Infrastructure which includes. 1. Create and edit different notice board layouts and contents. 3. Transfer of Digital Notice Board contents, layouts etc from source to Notice board Display server through internet. 4. Shut Down/ Restart Digital Notice Board server form a remotely. 7. Schedule different events and display it in notice board on specified date and time. 8. Unattended running of Digital Notice Board Displays. 9. Securely transfer Notice board contents over internet to the Display system server. 10. Various types of useful reports. 11. User Management and License Management. 12. Extend the applications using various plugins and KTS InfoMate SDK. b. Layout can be divided into several compartments and play different files in each compartments. b. All Images formats like JPEG, BMP, tiff, gif etc. c. Video formats like WMV , AVI, MPEG4, H264. f. Text with different types of fonts and scrolling text support. g. Display Fancy Date and Time controls in the layout. h. Extend other file type support using third party plugins and KTS InfoMate SDK. For more details about this product click here.